Get Ready! "Week(s) of Giving" Kicks off October 7th! Release your inner hero by contributing to the IPT-PAC during our 4th annual IPT-PAC "Weeks of Giving" (WOG). All donations made in supporting our IPT-PAC from October 7 - 21st will go towards continuing to improve access to quality and affordable healthcare for the residents of Illinois! Be a hero and rise up to the Week of Giving challenge and be prepared to donate in early October. We're continuing with our Strike a Blance PT Challenge this year. 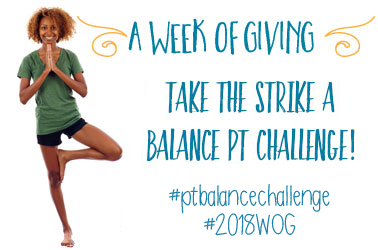 Help us increase the IPT-PAC fund balance by spreading the word about WOG via social media with an interactive example of the important role balance plays in wellness. Post a photo or video of yourself – or a group – striking a creative balance on Twitter or Facebook. Donate a minimum of $20 to IPT-PAC.